who in your existing database is most likely to move in the next 3-6 months. Our machine learning algorithms analyze millions of data points to reveal when someone in your existing prospects database is thinking of moving -- before they choose an agent or lender. Everything you need is in your existing prospects database. Empower your team to spend their time on the leads that matter. Better than 1 out of 3 times, Revaluate predicts that a move will happen in 3-6 months. What are you waiting for? See a demo today. Revaluate knows the Data D's that cause people to move: Diamonds, Diplomas, Death, Divorce, Downsizing, Dumpsters, Diapers, Discretionary Income, and The Daily Grind. 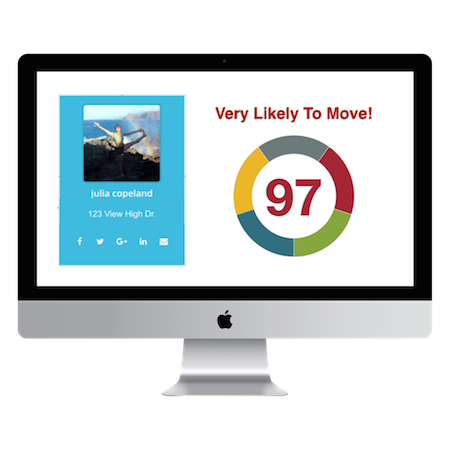 These indicate with a high degree of accuracy the likelihood of moving - they are the life events that our predictive analytics algorithms look for to determine the likelihood of someone needing to buy or sell a home. Everyone knows engagements lead to moving. Ten years ago, Realtors used to comb the Sunday paper for engagement announcements. Today, Revaluate researches engagements, revealing likely movers for you. You can almost hear the champagne popping. When kids graduate, parents frequently move. Sometimes - they help their new graduates find a home, make down payments and fund the mortgage. Diplomas drive deals. As tragic as death is, it frequently presents an opportunity to lend a hand and help the family, as many times a family must deal with selling the home. Good news: Fewer people are getting divorced now than at any point since 1980. However, 41% of all divorces include the selling of a property as part of the settlement process. You can help make a very difficult time a little easier. Revaluate is being used by some of the biggest names in the real estate and mortgage industries. Our artificial intelligence engines are helping them close more deals and improve their bottom lines. Revaluate has broken new ground in behavioral analytics. We improve our accuracy by scrubbing your database to remove duplicates, industry contacts, vendors and other email addresses that may skew results. We deliver likely mover prospects straight to your inbox, phone or CRM. Our simple interface makes it drag-and-drop easy to add, remove, or modify contacts. Revaluate has solutions for Enterprises such as Mortgage Lenders, Banks, or Brands, as well as Individual LO’s, Real Estate Agents, and Brokers. All while delivering up to 24X ROI. Revaluate is a 2017 Inman Innovator Award Finalist and a 2017 Swanepoel Top 20 Trendsetter. Like most Realtors, we have serious call reluctance when it comes time to make the calls. Using Revaluate makes it easier since you're calling people more likely to answer when the phone rings. Revaluate knows my prospects and is growing my database. Revaluate is a 2017 Top 20 Real Estate Trendsetter. Learn more about how Revaluate can help you leverage artificial intelligence and machine learning to convert your database into closed deals.